Yoga Banned from Public Schools? First appeared in the September 2013 issue of Christianity Today magazine. I was honored that Christianity Today asked me to write on this “powder keg” topic. Laurette Willis is a Christian fitness expert and founder of PraiseMoves, a Christian alternative to yoga (PraiseMoves.com). 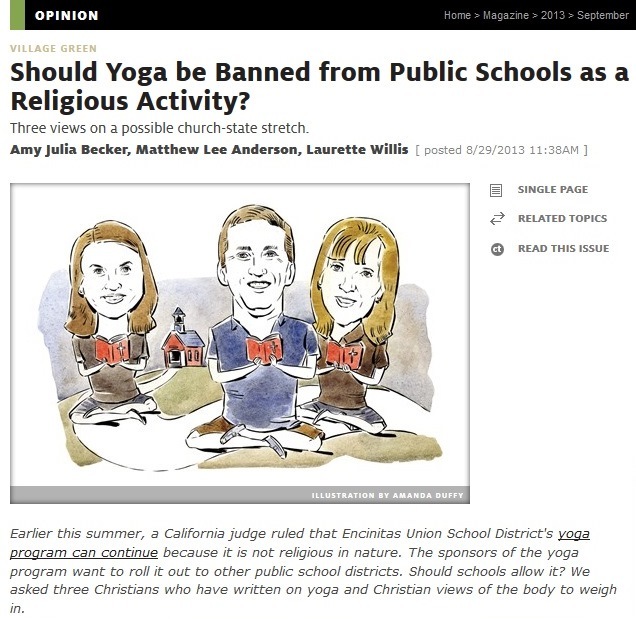 If religious activities like Christian, Muslim, and Jewish prayers are banned from public schools, then yoga should also be banned. “But yoga is just exercise!” many exclaim. Hindus, however, view yoga as part of their religion. Professor Subhas Tiwari of the Hindu University of America acknowledges that yoga originated in Hindu Vedic culture. He says it is impossible to separate yoga as a physical practice from yoga as a spiritual practice. I consider yoga a missionary arm of Hinduism and the New Age movement. I was involved in yoga and the New Age movement for 22 years, from age 7 to 29. I know firsthand that yoga offers much more than physical exercise. Before I became a Christian, I was a student of Hatha Yoga and Kundalini Yoga and an instructor of Hatha Yoga, as was my mother. My mother and I became involved in yoga through a daily television program. She found that the exercises relieved her stress. She became a yoga instructor, and I followed in her footsteps. Little by little, we began to favor visiting the ashram in upstate New York over church activities. As we became more involved, it also opened the door to numerous other New Age interests and practices. Yoga postures represent offerings to millions of Hindu gods. In fact, there is a dedicated “Lord of Yoga.” His name is Shiva, a supreme divinity. Yoga in Sanskrit means yoke or union, and famous yogis teach that “yoga unites the individual self to the universal self.” Thus, yoga practitioners are, however unintentionally, attempting to unite themselves to Hindu divinity. This is antithetical to the Christian faith. We are told to “abstain from things offered to idols” (Acts 15:29, nkjv). Jesus tells us to take his yoke upon us and follow him to find rest, “for my yoke is easy and my burden is light” (Matt. 11:30). But surely a public school's yoga class would be completely devoid of all religious aspects. Some promise this. But years later, when your child as an adult is visiting a bookstore and passes by the Eastern religion section and sees books on yoga, he or she may very well equate it with the warm fuzzies felt during those supposedly religion-free yoga sessions in third grade. One option for schools is to use our PowerMoves Kids curriculum. It focuses on character education and fitness, not religion. Christians realize there is a spiritual realm we cannot see. Paul warned that “we do not wrestle against flesh and blood, but against principalities, against powers, against the rulers of the darkness of this age, against spiritual hosts of wickedness in the heavenly places” (Eph. 6:12, NKJV). These spiritual forces have power, and they do influence us. They have a way of subtly and deceptively pulling us away from the one true God, our Lord Jesus Christ. Read the other opinions at link below, and feel free to comment! If you agree with me, you will be in the minority. Fair warning.